tutorials - Misc and Web-Development. 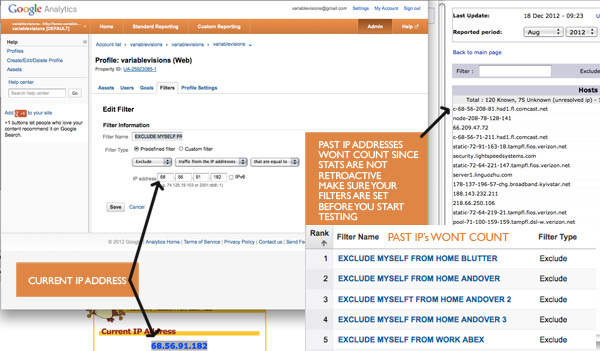 Check your current IP address and add it as a filter. Do the same for your work IP address and anywhere else you visit your own web site from. Also, if you moved into a new house or apartment and want to omit your last places' IP address, simply check the log files of your web server when you lived there and find out your old IP address. (But you should have done this in the first place…but I didn't ) EDIT: After testing this all night I finally realized that GA filters are NOT retroactive. That is, it is pointless to filter PAST IP address for the data will not reflect visits that already happened. In 2013, I will finally clean out my testing from my GA account. So, before you visit your site, make sure your IP address is filtered BEFORE visiting. This will keep your data clean and eliminate many page views from your own testing.